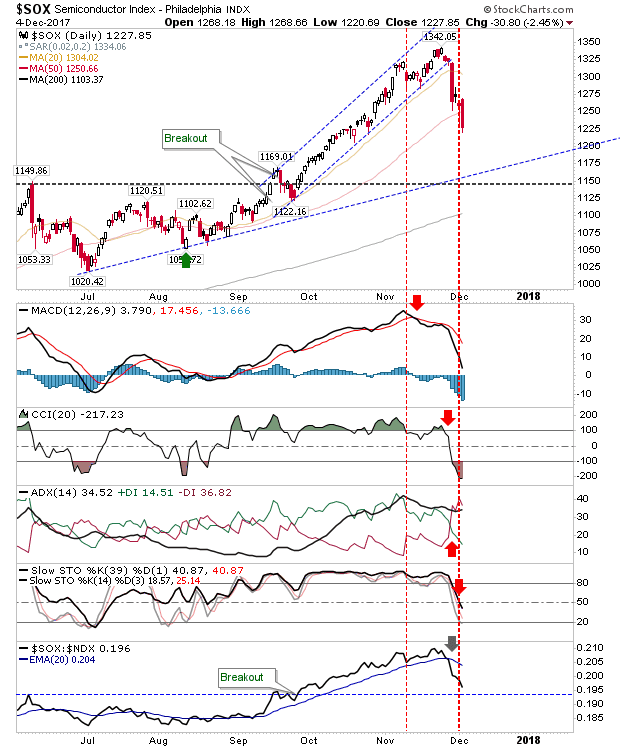 After Friday's sell-and-recovery it had looked like there was an opportunity to play a bounce, particularly for the Semiconductor Index. However, the reality proved to be different. 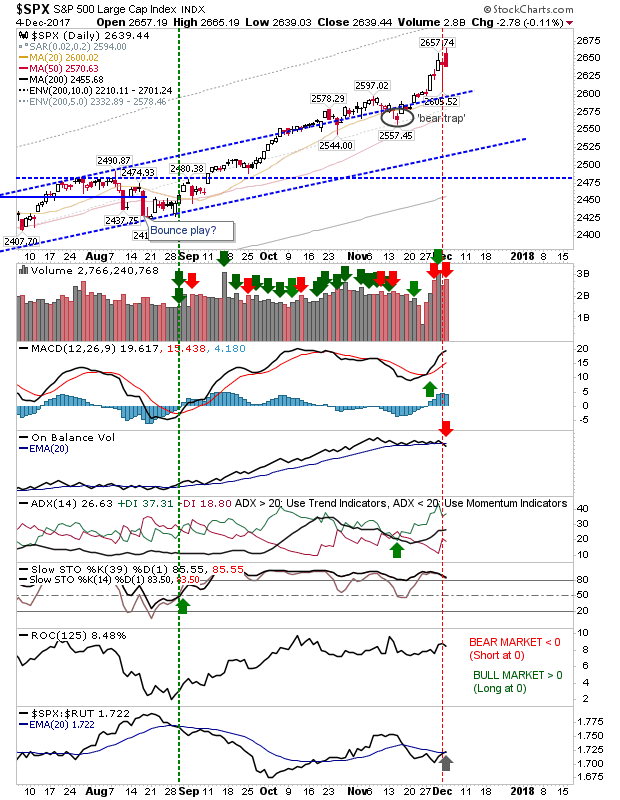 Instead, sellers maintained the run of form from Friday and pushed the Semiconductor Index right down to Friday's low - undercutting the 50-day MA in the process. Monday's close delivered a net bearish turn in technicals. 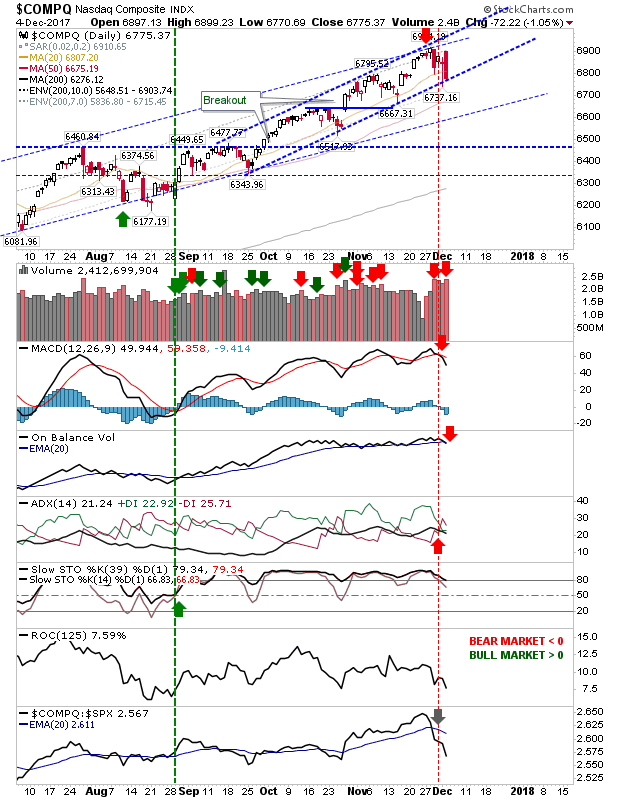 The slower trendline connecting the July-August swing lows is the next target down. Not surprisingly, the Nasdaq and Nasdaq 100 suffered in sympathy with the Semiconductor Index. 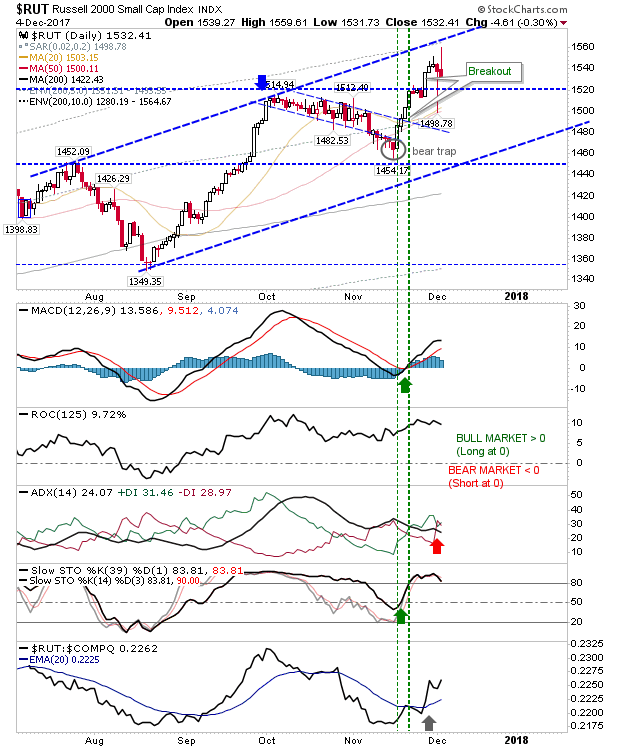 Selling action in the Nasdaq left the index at faster rising channel support. The S&P finished with bearish cloud cover on higher volume distribution. On-Balance-Volume closed with a 'sell' trigger but other technicals are still positive and relative performance was able to gain ground despite the down day in the index. The Russell 2000 closed with a spike high which is typically viewed a reversal candlestick. The one aspect in its favor was the relative tick higher against the harder hit Tech indices. Although bears really have the advantage here. Where Friday was about firming spike lows as swing lows; Monday has now become a marker for swing highs and the chance for shorts to play for a longer decline. The risk:reward isn't great but rallies back to Monday's highs can reduce the risk and offer reasonable short entry opportunities. Lower targets are channel support and 200-day MA. If you are long-only focused trader then the Nasdaq at its narrow channel support could see benefits if markets open flat or gap higher.